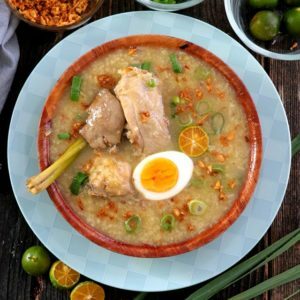 Make the best Arroz Caldo you can make! A very hearty Filipino rice porridge from glutinous rice and chicken. Made flavorful and fragrant from all the spices like ginger, calamansi, and crispy garlic. With added lemongrass and safflower for extra zest. In a large pot over medium heat, saute ginger, onion, and ginger in hot oil over medium heat until aromatic and onions and garlic are tender. Add in the chicken pieces and stir in fish sauce. Mix several times and cover the pot with a lid. Let simmer in own juice for about 5 minutes or until the outer layer is no longer pink, turning occasionally to keep them from burning. Add in the glutinous rice and cook while stirring for 2-3 minutes. Pour in the water. Add the lemongrass and safflower and bring to a boil. Cover pot to let the rice cook faster while mixing now and then to prevent the rice from sticking at the bottom of the pot. Cook for 10-15 minutes or until rice grains has expanded and become soft. Add pre-boiled liver and season with ground pepper. Add more salt or fish sauce if still needed. Cook for another minute or 2. Ladle Arroz caldo to bowls with chicken pieces and liver as desired. Top with half hard-boiled egg, crispy garlic, leeks, and calamansi or lemon.